How to have fun with the world. 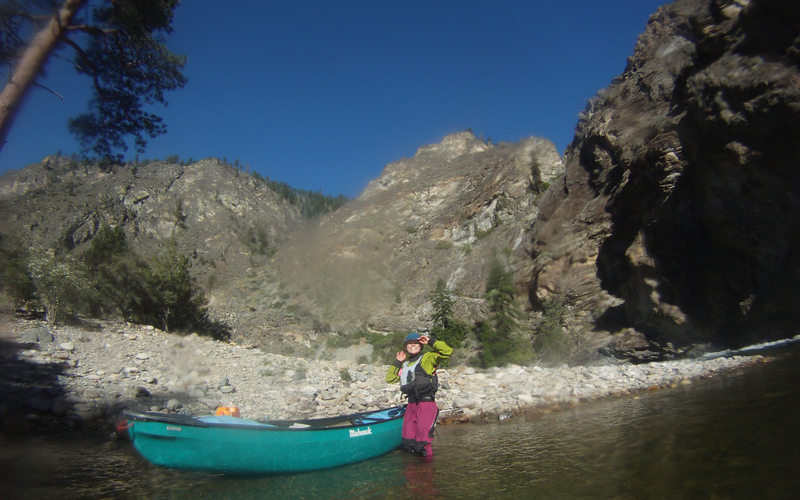 In the middle of June, I had the fortune of being part of an all-women’s multi-day whitewater trip down the Middle Salmon River in Idaho. When I found out that Canyons—the rafting company leading the adventure—provided whitewater canoes for the adventure, I immediately picked the only one small enough that I could paddle. The Mohawk Viper 11. Like most introductions to new boats, paddling the Viper over those six days was like experiencing a new relationship. At first, it seemed like we just were not meant to get along. At this point, I had been so happily involved with my Blackfly Ion with its quick response to my strokes and nimble nature that the Viper seemed like an old man. However, after paddling it for two days, I quickly realized it was in fact my own inexperience that failed to awaken its potential. I love the Ion, but it’s got a lot of kayak characteristics, such as the hull and length, that allow me to get away with bad “kayak” habits. The Viper is a canoeist’s canoe and would not put up with any bad technique. By the end of the trip, I became a better canoeist overall, and I owe that to both time on the water and time in a different boat. The experience taught me that ya gotta experience everything that’s out there so you’re missing out. Fun note, I learned why boating is better than relationships—no one frowns at you when you’ve got a whole stable and something different to ride every day of the week. The Viper 11 is a good size at almost 12 feet, long enough to get purists off your back and short enough to still whip around with a good sweep stroke. As an ABS boat, it’s light, too—45 lbs. Unlike some of the other boats I’ve reviewed, the Viper 11 and 12 can fit a much wider weight range of paddlers. I’m probably at the very bottom of the size and weight range for the Viper 11, but it definitely worked, and bigger paddlers can also enjoy it. It’s got about an 80°-angle from the boat’s edge to the water surface, which makes for great secondary stability, and it lacks just enough primary stability to turn easily and surf. SPEAKING OF SURF—I caught the biggest accidental (and in general) surf of my life at the Marble campground play wave. This boat handled it like a champ. I caught the wave, got side surfed, and just kept that edge up. Even after filling with water, the Viper hung in there and let me ride it out. With that boat’s secondary stability, I was able to brace back up from completely flipping over (on my on-side). It’s a fun boat to surf! Not so much fun to roll. This is another example of how using different canoes makes one a better overall paddler. While the Detonator and Ion quickly land both gunnels on the water when they flip, the Viper just kind of hangs there with one gunnel in the water and the other gunnel in the air and you looking/feeling like an idiot. The viper can be rolled, but it requires more precise technique than some other canoes (hint, keep your body forward and flat against the boat when you’re trying to get from off side to on side). It’s never bad to have something hold you and your technique accountable! While it’s not the most exciting encounter of my life, the Viper and I did learn to get along and have a lot of fun rides and surfs on the class III-IV rapids of the Middle Salmon. Most importantly, the Viper forced me to hone in my roll and some paddling techniques. So get out and try it! Then try a bunch more. The Viper and it’s close brother The Probe were designed by Frankie Hubbard, probably one of the best open boat designers ever. (Also Okoee and a few other classic designs.) I’m convinced that the Probe is probably the best general-purpose WW Canoe ever built. They’re all pretty awesome boats, for sure. I’d like to get an Ocoee at some point! How’s the boating back in the Northeast?